﻿ Chicago Hispanic Newspaper, Lawndale News, Hispanic Bilingual Newspapers, Su Noticiero Bilingue » Dalton Trumbo, Hero or Anti-hero? April 25, 2019 5:03 pm You are here:Home Commentary Dalton Trumbo, Hero or Anti-hero? Posted by Editor on March 17, 2016 in Commentary | Comments Off on Dalton Trumbo, Hero or Anti-hero? 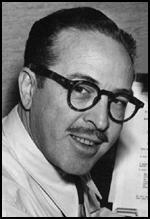 Recently Hollywood made a biographical film about the famous screen writer Dalton Trumbo. Persecuted in the 1940’s and 1950’s by the House on Un-American Activities Committee (HUAC), Trumbo was blacklisted by the U.S. Congress at the time for refusing to testify against possible Communist influence in the film industry and refusing to give any names of people who might have been Communists or had an Communist sympathies. The film, Trumbo, which came out late last year and is still playing in movie theaters, tells the story about how Trumbo, being blacklisted by both the U.S. Congress and Hollywood, had moved to Mexico City and wrote screen plays under pseudonyms so that his scripts could be used. He wrote and contributed to such famous movies like Roman Holiday, Exodus, Spartacus, and Thirty Seconds Over Tokyo. The film definitely makes him look like a hero, and something of a martyr. There is no question that he suffered due to the anti-communist hysteria sweeping the United States at the time, and which victimized a lot of innocent people who had no interest in Communism and had no affiliations with the Communist Party U.S.A. This was no the case with Dalton Trumbo. Trumbo had joined the Communist Party in 1943. This in of itself would not really have been relevant either. However, Trumbo always defended Josif Stalin (dictator of the Soviet Union from 1929 until his death in 1953), and this put him at odds with many other actors and actresses as well as screen writers in Hollywood. By no stretch of the imagination do I justify what the HUAC did, and how it victimized innocent people. But Trumbo was essentially defending a dictator who slaughtered an estimated 30 to 35 million of his own people, who ruled with an iron fist, and whose brutality sent countless screen writers to their deaths into the Soviet slave labor camps at the time. Would Dalton Trumbo himself have survived if he had lived in the Soviet Union under Stalin? This is something not found in the film about Trumbo’s life, and it has to make me wonder why this important part has been left out. Has Hollywood forgotten this aspect of Trumbo’s life by accident or on purpose? When Stalin’s crimes were denounced even in the Soviet Union under its premier Nikita Khrushchev, Trumbo never says a word against Stalin, nor the horrible crimes committed against innocent people in the Soviet Union. So we have a film that makes Trumbo look like a hero, but does not provide a more composite portrait of a man who mirrored his times. What is especially disturbing about the film Trumbo is how it glosses over the influence of the Communist Party U.S.A. during the 1930’s and early 1940’s, and how Stalin tried to use the Communist Party as an instrument to influence America. Well, all I can say is that one should not believe everything that comes out of Hollywood.